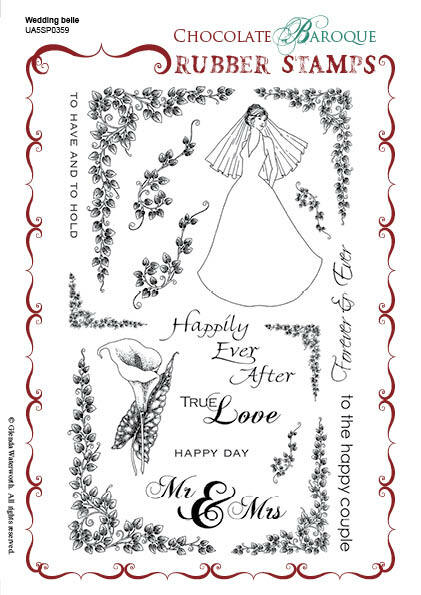 This rubber stamp set contains a bride and several leafy corners in an assortment of sizes, together with 7 different sentiments realting to weddings, anniversaries and engagemnts. 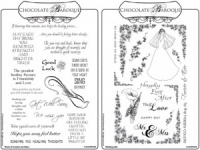 Because of the variety of sizes of the corners it would be quite easy to create a complete set of matching wedding stationery from small place cards right through to invitiations and order of service. A detailed and beautiful set that you will find useful for so many styles of project. A really elegant set of quality stamps. Unmounted for you to mount yourself or use as they are after cutting. 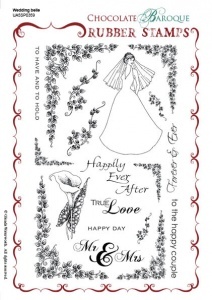 The designs are great and also will be suitable for occasions other than Weddings. I like the fact that the corners have an opposite so that all corners, when stamped, mirror each other. Of course, not just for corners......another set I recommend for your "investment" ! !